Today’s ContiRoll®s may operate as fast as 2,500 mm/s, which means they need an efficient finishing line to match. It must be possible to cut even the shortest boards. Besides, the change of a saw blade must not affect the current production. Siempelkamp’s 6-unit diagonal saw has been developed to achieve the maximum output in continuous operation. The increased dust emission rate associated with the increased number of saw cuts has been taken care of and eliminated. Owing to the modular design, the assembly of Siempelkamp’s 6-unit diagonal saw is easy and owing to the latest startup simulation, the diagonal saw can be started up in no time. Simulation also enables sequential product changes or board format changes which are realised in the course of continuous production. All necessary functions are optimally integrated into the control concept. In a mechatronic approach the required process parameters are collected at the machine stand and processed by the process control system. It is thus possible to make lab cuts and saw blade changes in continuous operation at full production speed. 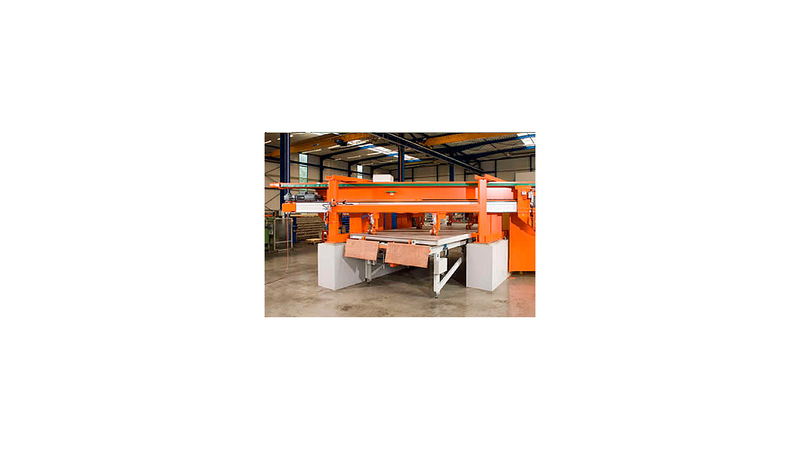 During continuous operation Siempelkamp’s 6-unit diagonal saw cuts the respective product ultra-fast. The use of friction wheels enables a perfect adjustment to thin boards, which are produced at speeds of up to 2,500 mm/s. The extraction hoods of all Siempelkamp saws have been adjusted to a high-speed production. It was possible to increase their efficiency significantly by analysing their extraction volume and by optimising their design to the new dynamic flow. The modified hood geometry has improved the extraction capacity by 40 to 50 % , while at the same time using less energy since less extraction capacity is needed.